The MSRP on the BMW could be higher and it’d still be a value. For $14,950 it’s an absolute steal! When it comes to the BMW S1000R being a better motorcycle than the KTM Super Duke R, here are the facts. The BMW is lighter, costs $2k less, has electronic suspension and cruise control, and is only 0.7 horsepower down on the KTM. Torque, of which the KTM has 10.2 ft-lbs more, is one of the few performance factors where the SDR outshone the BMW. So, why did the KTM win each editor’s subjective scoring on the ScoreCard but still lose the overall shootout to the BMW? Let’s break it down. The KTM’s V-Twin is clearly the better engine, no argument among the editors there, but the Beemer’s quickshifter and butter-smooth transmission handily defeated the KTM’s non-electronically aided unit. 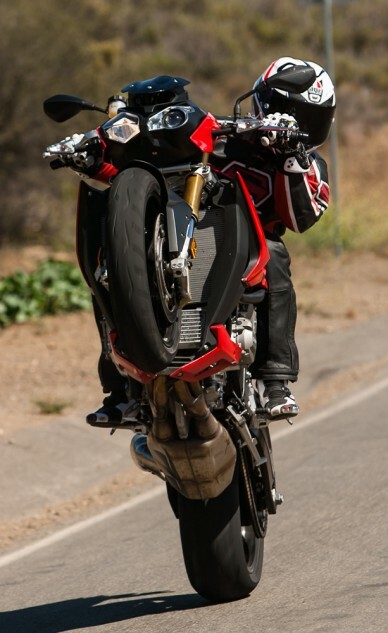 From a head-on view, the S1000R looks as wide as a schoolbus because of its inline-Four arrangement … a schoolbus on one wheel, that is! For those with no intention of participating in a trackday aboard any of the machines, this lessens the BMW’s advantage because the KTM’s transmission works great in everyday operation, but even canyon carvers will appreciate the quickshifters on both the BMW and the Aprilia. The BMW also suffers from some high-frequency buzz from its non-counterbalanced inline-Four. “Vibes are omnipresent and evident at many points of its rev range,” says Ed-in-Chief Kevin Duke. However, Siahaan and I weren’t quite as bothered other than at high revs on the track. “Near the end of my double-stint, the vibes were making my left hand numb,” says Troy. The BMW is nimble yet also stable, whereas the bigger KTM (longest wheelbase of the bunch at 59.3 in) felt relatively lethargic in quick-transitioning chicanes. At the track, it was the Aprilia that took top honors in the handling department. At Chuckwalla Raceway, where shifting is minimal and sweepers prevail, the KTM was fantastic, but the BMW and the Tuono are both more nimble machines, even with the Aprilia’s hefty 474-pound curb weight. All three are amazingly competent brakers, but the KTM’s M50 Brembos are currently the industry standard and the other two don’t have ’em. 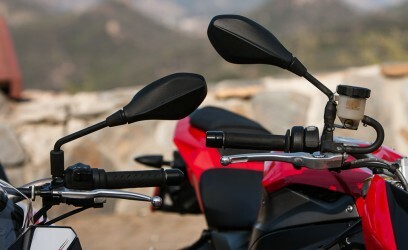 Embarassingly, both BMW and Aprilia wore the exact same mirrors to the prom. With the aforementioned electronic suspension and cruise control – rider aides the other bikes lack – the BMW is untouchable in the technology department. The Aprilia’s APRC electronics suite is more customizable than the Beemer’s, but that doesn’t make up for the lack of the suspension and cruise control technologies. Also, it doesn’t have the heated grips of the BMW and KTM. The Instruments/Controls and Ergonomics/Comfort categories were a wash, with the BMW winning the former and the KTM the latter. In the Ergonomics category, however, the Super Duke’s adventure-touring-like seating position and roominess crushed the other two. The BMW has a much lower seat height and also voluptuous seat padding. 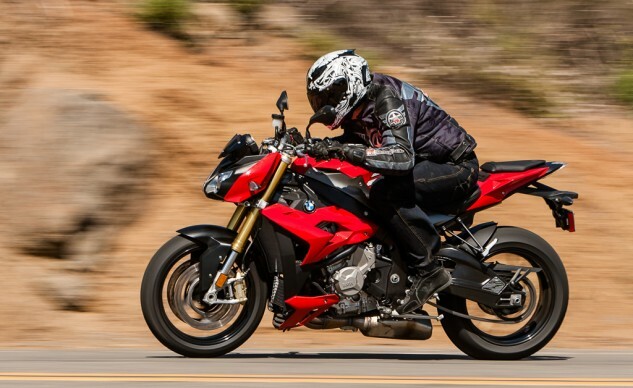 “I’m a big fan of nimble bikes, and the S1000R is the most agile of this group – there isn’t a corner too tight for the BMW to quickly carve through,” says Duke. Now’s when we get to the few categories that are easily arguable and often are argued among the editors conducting the testing, but in this case it was a clean sweep for the KTM. Winning the Appearance, Cool Factor and Grin Factor categories put the the Super Duke R on top, winning the overall subjective scoring by a scant 1.02%. It’s only when we factor in the objective categories of price and weight that the BMW surpasses the KTM, by an even scanter 0.06%, 92.13% vs 92.07%, respectively. 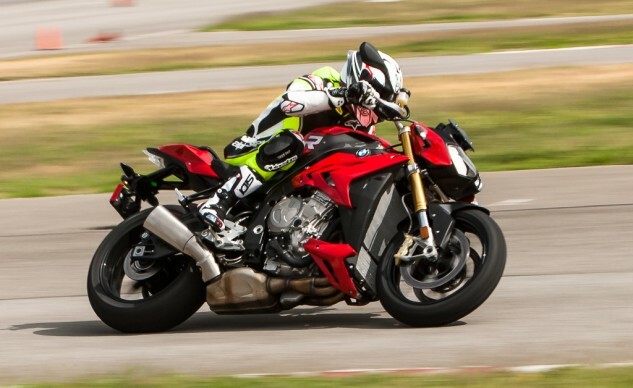 For $15k, what you get with the S1000R is a bike with more technology than the KTM, an insanely fast engine and ergonomics that make riding to and from a trackday a reasonable proposition. Like its full-faired counterpart, the S1000RR, the naked version does everything with Germanic clockwork precision that’s hard to fault.